The Ordinary Life of an Extraordinary Girl: Alex "the breeze"
It was an Alex kind of a weekend, again! My 16 year old daughter with down syndrome is having the same kind of spring as millions of teenagers around the world; a very busy sports season. Although this involves a lot of driving on our part; it is worth it to see Alex so successful. Also I dare say – she is losing weight!!! Every hour in the car is worth the effort for Alex’s health and well-being. First up was Ninos swim practice on Friday night. The Special Olympic Athletes are only able to participate in one sport for the summer games, which are scheduled the first weekend in June. However, the regionals are held on different weekends – so Alex has opted to swim and compete in track and field. We love her enthusiasm around these work-outs. Alex is a good swimmer. She can get from one end of the pool to the other with a modified crawl stroke. She will pull one arm out of the water and stretch it as far as she can. She then uses the other arm and takes a quick breathe. She kicks, mostly underwater, when I see her swim I know she is safe, but I do find it a bit entertaining to watch – her motions are not all in sync – but she sure can move. Alex also needs to wear a face mask. She is not good at holding her nose, so will not swim unless she has a mask that covers her eyes and nose. This had been an issue in public pools that have banned this type of mask, and only let kids wear goggles, but overall this single adaption has been successful. Alex had a soccer game on Saturday and played for a good portion of the second half. She is very good at moving up and down the field, staying in the middle and avoiding the ball. The girls will pass to her if she is open, but mostly I find JV soccer to be a bit of a scramble. It was another triumph, not only for the team, but for my adorable number 15. Alex’s favorite sport and the reason for this year long journal is track and field. 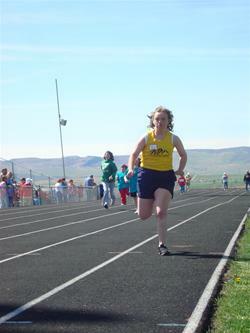 She will be compete in the 100 meter, 200 meter, 100x4 relay and the softball throw for the regionals. Additionally, Coach Paul is working with her on the 6.6 pound shot put, as it is not an event at the regionals. A few of the parents usually stay and watch their athletes at swimming and track practice. John and I are not those parents. First, our daughter yells at us if we stay, but mostly I enjoy the two free hours to run errands and do my own thing. Yesterday was John’s turn. When John arrived at the track he was able to see Alex lead off the relay, and could not believe how fast she ran. I am curious if Alex’s time this year will be as fast as last year, due to her 15 pound weight gain….Or perhaps in a few weeks it will only be a ten pound weight game? We will see. John was approached by an impressed parent who created a new nickname for Alex; the unlikely moniker - “the breeze”. When Alex arrived home, she was still running, in the door and to my room; “Mom, my new nick name is “the breeze”. Yes, Alex run like the wind and always keep that sense of pride and accomplishment with you, it will get you far in life.